GUADALUPE VICTORIA, Mexico (AP/CBS 8) - A moderate aftershock has rattled northern Baja California, days after the area was struck by a magnitude-7.2 earthquake. 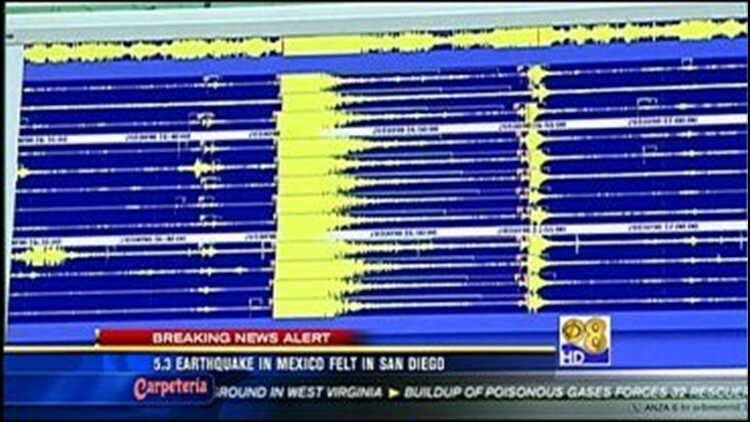 This latest aftershock was felt throughout San Diego County Thursday morning. The magnitude-5.3 aftershock hit around 9:45 a.m. Thursday, centered near Guadalupe Victoria about 30 miles south of Mexicali. California Gov. Arnold Gov. Schwarzenegger toured the quake-stricken U.S border city of Calexico Thursday morning, but his spokesman says he left before the aftershock. Several hundred aftershocks have been recorded since the Easter Sunday quake, with the largest registering magnitude-5.7.